Ideal choice for stony conditions. 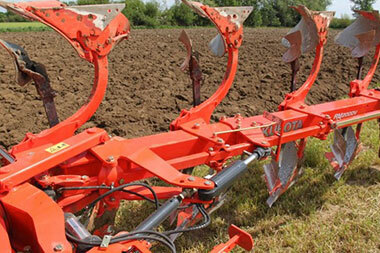 This mounted reversible plough aims at intensive ploughing for small to medium size farms. Robust 150x150mm induction heat treated frame to the same standards as all Kubota ploughs. No welding to avoid weaknesses. Robust 150 serie head stock with a heat treated 110mm Ø main shaft. Recommended for tractors up to 150 HP. Low lift requirements, easy to pull. Easy to adjust and to operate : 1st furrow adjustment via the parallelogram system automatically corrects the alignment of the plough. Adapts easily to different tractors and wheel settings. Hydraulic front furrow adjustment and hydraulic alignment of the frame are also available. Unrivalled Non-stop system for continuous ploughing. Bodies release independently to one to another. No maintenance! Stepwise adjustable working width : 30 to 50cm (12”-20”). Choice of cross shaft, category II and III or quick coupling option. 3 to 5 furrows, extendable by 1 f. (max. 5 furrow plough). The frame is an essential part of the plough construction. For Kubota quality standards, a non heat treated part is a weak part! Kubota frames are heat treated by induction twice. 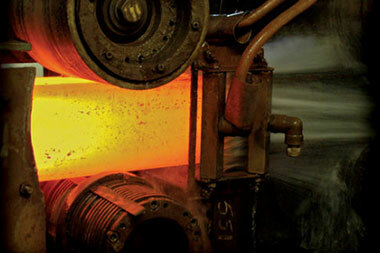 The temperature transfer to the steel is closely monitored. The frame gains 3 times as much strength. This unique Kubota induction processes provides robustness and flexibility while ensuring an outstanding durability. For the equivalent Kubota robustness, competitors would use more steel in thickness or in dimensions, therefore producing a heavier frame. Weldings are also a critical weakness for a plough frame. Kubota frames are supplied as one sole part! 150 x 150mm for 3, 4 furrows, extendable by 1 furrow max. 4 F. plough. Body No. 28 – “Wide tyre body” suits all soils; even heavier soils than body 8 very wide empty furrow for tractor wheels up to 710 mm good turning and well packed easy pulling suitable for Depth: 15 to 30 cm ( 6 to 12”) Width: 30 to 55 cm (12 to 22”). Body No. 34 – Plastic mouldboard Long and slim shape (similar to body 28) For soils with high humus content without stones Advised for tactors with large tyres Easy pulling Working depth: 12-5cm Working width: 30-55cm Landside / mouldboard: 40 degree. Kubotas fully automatic non-stop Auto-Reset System is unbeatable when it comes to trouble-free ploughing in stony conditions. The clever multi-leaf spring system allows the plough legs to release over stones and other solid objects in a smooth and efficient manner. This avoids sudden jolts and possible damage. Once the obstruction is passed, the plough body automatically returns to the correct ploughing depth. With today’s demands for higher output, both tractor and plough are expected to perform quicker than ever. This makes more arduous demands on the equipment, particularly on the safety systems designed to protect tractors, ploughs and drivers against the dangers encountered whenever the plough meets hidden obstructions in the ground. The Kubota Auto-Reset system guarantees high standard safety requirements. 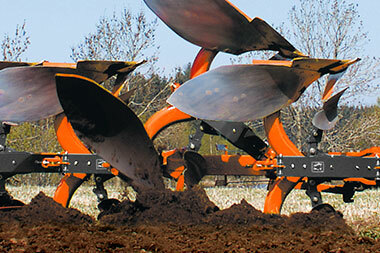 Depending of the type of soil all Kubota ploughs can be equipped with different leaf springs packages. For soft soils, a normal spring with 5 leaves is the best choice to obtain the perfect ploughing in stony conditions. 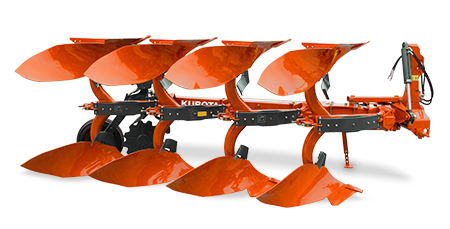 Today, most Kubota ploughs are delivered with the Heavy Duty springs package (HD) with 7 leaves. This will perform well in most conditions. If the soil is very hard and stony – a double leaf spring package is recommended. The standard Auto-Reset system includes 7 Kubota heat treated springs (640Kp). 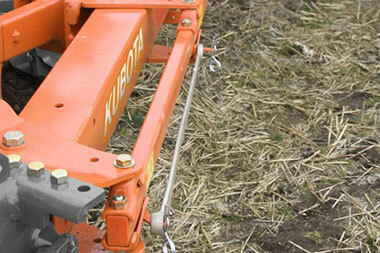 The Kubota mechanical Auto-Reset system enables very plough body to release independently. A quality ploughing is therefore guaranteed. Kubota’s Auto-Reset System is a quite simple construction that withstands the punishing forces year in, year out, with a minimum of maintenance. Save time and money! 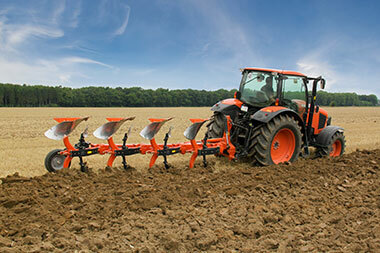 Moreover, the Kubota auto-reset system guarantees a longer life to the plough. When hitting an obstacle, the pressure on the point, frame, plough parts, decreases. The stress on Kubota ploughs is therefore reduced. Consequently, second hand Kubota ploughs sell at a higher value than competitors ploughs. More than 130 years of experience. Steels that withstand the toughest of conditions. Best robustness/weight ratio on the market. For equivalent robustness, competitors would add more steel and therefore more weight, quicker wear, disappointing ploughing results. A Kubota plough is a peace mind!